I was pleased to see (“On the Right Track,” Summer 2013) that you do not share the Wall Street Journal’s hatred of railroads (and bicycling and walking for that matter). One of my very few professional regrets is following my father’s otherwise excellent advice when I left MSM/UMR/Missouri S&T in 1967. A railroad employee all his working life, he recommended I not consider railroads as a career. For about one decade, the advice looked sound; but as we, and Warren Buffet, know this has changed dramatically. Based on what I saw while riding the “High Line” from Seattle to Minneapolis, It would appear that Travis Duncan, the subject of the article, faces better employment prospects than pipeline engineers. Kudos to Missouri S&T Magazine. It is a great publication. It is amazing the number of women that are mentioned. I graduated in January 1963 and I think the number was around 30 then. I am what you might call one of the ol’ timers. I graduated from, as we called it, MSM, way back in 1947. This afternoon, I was sitting in the swing on our front porch in Erwin, Tenn., that is halfway between Flag Pond, Tenn., and Unicoi, Tenn. (now you know where it is! ), reading the summer copy of your Missouri S&T Magazine. I enjoyed it very much. You all did an outstanding job. I finished reading it and picked up my copy of the July 15, 2013, National Review. On page 27, I saw an article titled “Blowing up Barbie.” I didn’t think I wanted to read it until I saw “Rolla, Mo.,” under the author’s name. This piqued my interest and I found the article to be very interesting. I don’t know whether or not you have seen it. On the assumption you did not, I have enclosed the article. I found it to be very interesting as it told the story of the Explosives Camp offered at Missouri S&T. Keep up the good work. Miners are makers. Maybe not always in the traditional sense, but the theme of making is a deeply rooted part of who they are. Look around your house. Your office. Your car. Nearly everything you see has a connection to a Miner, from basic personal needs like shampoo, diapers and prescription medications to lawn mowers, bleach, bed springs and adhesives. Even the railroad that transports these goods and the credit cards you use to purchase them involve Miners. That trait has marked Rolla students since the university’s founding in 1870. From the first day they step onto the Rolla campus, Miners are taught to push beyond theory — to grasp and tinker with what could be. To think. To create. And to do the hard, practical work needed to make things happen. We’ve come a long way since our graduates helped drive the Industrial Revolution and launch the Space Age. Today, our graduates continue the tradition of creating real solutions to everyday problems. In corporations around the world, Miners use their skills, knowledge and creativity to produce the goods and services that we encounter every day. Nine different alumni — and the companies that employ them — are represented in this issue. Their stories illustrate just a few of the ways that Miners touch our everyday lives. We may not know what tomorrow’s great must-have will be. But we know our grads will be involved in making it. Dambach, a manufacturing project leader for Pampers, acts as a liaison between her plant and others. Her workday includes preparing projects, making sure proper documentation is done, facilitating conference calls between “diaper design engineers” at various plants (both domestic and international), and troubleshooting the execution and assembly process. And while these job duties don’t necessarily sound like those of a typical mechanical engineer, she says her current position allows her to draw on her engineering background. 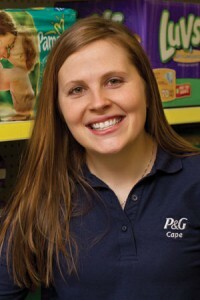 Dambach was first introduced to P&G when she was invited to attend a Minority Technical Summer Camp in Cincinnati after her freshman year at Missouri S&T. “The next summer, I interned with Bounty Research and Development in Cincinnati,” she says. Dambach returned to P&G for two additional internships, both times to the manufacturing site in Cape Girardeau, Mo., the same plant where she currently works. She and her husband, Travis, live in their nearby hometown of Jackson, Mo., with their toddler, Birkley. Dambach says her daughter gives her an invaluable perspective on her career. The amount of pride and dedication Dambach puts into her work is a direct reflection of what P&G puts into their employees. P&G strives to maintain the family-friendly feel it was built upon more than 175 years ago. Headquartered in Cincinnati, P&G has production plants in more than 80 countries and consumers in more than 180 countries. The company now manufactures more than 300 products, from Crest to Tide, and at least one product is found in nearly every American household, according to a recent Wall Street Journal report. Dippel is talking about Express Scripts Inc. in St. Louis, where he is senior manager of operations. His group manages the order intake channels for the company’s home delivery operations. “We’re involved in the entire home delivery process, so we interact with all areas — from the home delivery technicians, the pharmacists who communicate with both the patient and the doctor’s offices, and the people who fill the orders and send them out,” he says. Dippel is also a member of the strategy and continuous improvement group, which helps shape the vision for home delivery operations and looks for ways to drive out waste. The company recently acquired another large prescription benefit management company, Medco Health Solutions. 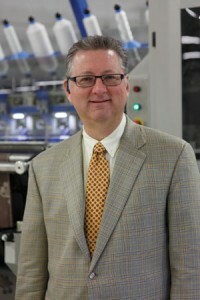 Dippel has had a large role in helping the companies integrate. Brad Lind, EMgt’96, is a quality guy. To him, quality — the continuous improvement of products and services — is a key driver in improving consumers’ lives. A member of The Clorox Co.’s corporate quality assurance team, Lind focuses on reducing risks and increasing consumer value with new and existing products. A 16-year veteran of the company, Lind and other members of his team do that by examining the several different data streams available from all the business units — from its namesake bleach and cleaning products unit to Kingsford charcoal. He takes a systematic approach to driving out waste at the plant. After graduation, Lind joined First Brands Corp. in Rogers, Ark., as a production supervisor at a Glad manufacturing plant. It was a typical entry-level position for an engineer with the company. Lind liked that Clorox Co. is a true manufacturing facility and over time, he says, he got to see it move from manual processes to automation. The company now embraces technology, Lind says. Lind had the opportunity to take on different roles after Clorox acquired First Brands in 1999. After leaving Arkansas, Lind joined the leadership teams at a Glad manufacturing plant in Amherst, Va., and then later at Forest Park, Ga. At that time, due to supply chain needs, the company closed a couple of plants and shifted its operation to the Atlanta area. For the last three years, Lind has worked in a satellite office in Kennesaw, Ga., where operation services and R&D teams are housed. Outside of work, Lind enjoys spending quality time with his family. He and his wife, Angela, have a 10-year-old son and an 8-year-old daughter. A former Miner football player, Lind now finds himself on the sidelines, coaching his son’s football and basketball teams or cheering on his daughter’s competitive gymnastics team. As Clorox celebrates its 100th anniversary this year, Lind credits the company’s success to its emphasis on finding the right people. Breenae Washington, EMgt’12, didn’t know what to expect when she started her first job after graduation. As a member of the global project management office, Washington helps manage the financial aspects, plans and team schedules for projects. She’s also part of a team that is working to help MasterCard better market itself to top talent.